His Holiness Kyabje Trulshik Rinpoche (Ngawang Chokyi Lodeo) is revered as one of the most learned and respected living masters of the Tibetan Buddhist Nyingma tradition, and he is also an accomplished practitioner with profound knowledge and experience in Tibetan Buddhism. His Holiness Kyabje Trulshik Rinpoche is the heart son of His Holiness Kyabje Dudjom Rinpoche and His Holiness Kyabje Dilgo Khyentse rinpoche, who of the most respected Dzokchen master of the last century. As a holder of several key lineages in Tibetan Buddhism, His Holiness Kyabje Trulshik Rinpoche is also one of the His Holiness Dalai Lama’s main masters. It is prophesized that His Holiness Kyabje Trulshik Rinpoche will be the 1,000th Buddha in the current Bhadra Kalpa (or the fortunate Aeon), during which time all those connected with him will accomplish Ultimate Liberation. His Holiness Kyabje Trulshik Rinpoche was born in 1924, the Wood Rat year, on the 10th day the 9th Tibetan calendar, which fell on the holy day of Guru Padmasambhava, and his birthplace was the holy Onray cave located in southern Tibet. Many auspicious omens prevailed at birth. His father, Tenzin Chodrak, was a yogi and his mother, Jamyang Wangmo, was a descendent of the first Gyalwang Drukpa Tsangpa Gyare Yeshe Dorje, founder of the Drukpa lineage. Since young, His Holiness Kyabje Trulshik Rinpoche exhibited great interest in spiritual practice; he was invited by his guru Dzatrul Rinpoche (the heart disciple of the previous Trulshik Dhongak Lingpa) to Dzarong Phu monastery in Rongphuk, south of Mount Everest, at four years old. At the moment of arrival, His Holiness Kyabje Trulshik Rinpoche recalled the incidents in his past life, thus Dzatrul Rinpoche confirmed that the child was indeed the reincarnation of his guru, Dzatrul Rinpoche provided an extensive enthronement ceremony at the monastery and thereafter became His Holiness Kyabje Trulshik Rinpoche’s root guru, transmitting the entire lineage he received from his late guru back to his guru’s reincarnation. 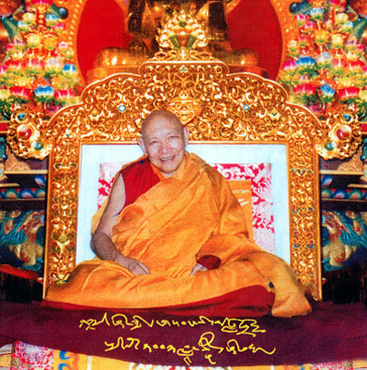 At Mindrolling monastery, His Holiness Kyabje Trulshik Rinpoche displayed his understanding of the profound teachings of the Buddha, and he received teachings from Rinpoche like Minling Khenchen Khyentse Norbu Rinpoche, the entire lineage of Vinaya, thereby completing the full ordination vows, today, His Holiness Kyabje Trulshik Rinpoche is widely known to be one of the holders of such rare Vinaya lineage, and because of his ability to keep and sustain the purity of the Vinaya lineage, he has been giving full ordination vows to thousands of monks and nuns. His Holiness Kyabje Trulshik Rinpoche received countless teachings and instructions on Vinaya and Tantra from many great masters. He has more than 30 masters from the old (Nyingmapa) and the new (Sarma) school of Tibetan Buddhism. His Holiness Kyabje Trulshik Rinpoche put into practice the teachings and instructions he received from these great masters and completed the traditional three year solitary retreat, even after this, he has never stopped his spiritual practice. Under the request of Dzatrul Rinpoche, His Holiness Kyabje Trulshik Rinpoche became the Abbot of Dzarong Dhongak Choling monastery, taking charge of the maintenance, up-keeping and the teaching activities at the monastery. At the age of 38, His Holiness Kyabje Trulshik Rinpoche received from His Holiness the late Dudjom Rinpoche Jigdral Yeshe Dorje the full oral transmission and empowerment on Nyingma Kahma, and he is one of the important expounder of this unique Dudjom lineage. From His Holiness Dilgo Khyentse Rinpoche, he also received a great many Terma (hidden treasure) teachings, His Holiness Kyabje Trulshik Rinpoche saw His Holiness Dilgo Khyentse Rinpoche as his root guru who revealed the nature of his mind. His Holiness Kyabje Trulshik Rinpoche also gave His Holiness Dilgo Khyentse Rinpoche some rare teachings from his own lineage. Thus both great masters began a unique and mutually beneficial spiritual exchange. At this point in time, His Holiness Kyabje Trulshik Rinpoche is the principal hear-son holding the entire lineage of His Holiness Dilgo Khyentse Rinpoche, and therefore he was responsible for searching, confirming and enthroning His Holiness Dilgo Khyentse Rinpoche’s reincarnation. Now that His Holiness Kyabje Trulshik Rinpoche has fulfilled this duty, he has also taken over His Holiness Dilgo Khyentse Rinpoche’s responsibility of giving transmissions and empowerment to His Holiness the 14th Dalai Lama. His Holiness Kyabje Trulshik Rinpoche is one of the great spiritual practitioners of this age, who has accomplished the level of Dzokchen. He has given initiations to many reincarnate masters and Khenpos. With student all over the worlds, despite being 87 years old, His Holiness Kyabje Trulshik Rinpoche continues to energetically profound the beneficial teachings, using his entire life for solitary retreats and spiritual practice. Every morning His Holiness Kyabje Trulshik Rinpoche abides by the vows of silence until ten o’clock in the morning. Every year, he would spend at least nine months in solitary retreats at his own monastery, one month in Maratika cave and one month in Dharamsala for giving teachings to His Holiness Dalai Lama. As a guru among guru, His Holiness Kyabje Trulshik Rinpoche is acclaimed by all the great Tibetan masters as a master who has the ability to bless and point directly at one’s nature of mind. Many benefactors of the Buddhadharma have made countless attempts to request for teachings and blessings from His Holiness Kyabje Trulshik Rinpoche. Ever since His Holiness Kyabje Trulshik Rinpoche came to Nepal from Tibet in 1959, he has resided at Thubten Choling monastery in the mountainous Himalayas, where he gave teachings and initiations to thousands of students and devotees in the Tibet-Nepal border. In recent years, His Holiness Kyabje Trulshik Rinpoche has traveled to other places in the world such as America, France, Switzerland, Spain, England, Taiwan, Singapore, Thailand, Malaysia and etc. to give teachings. His Holiness Kyabje Trulshik Rinpoche’s profound knowledge in the Buddhadharma, unwavering commitment in spiritual practice and his humility in treating all beings as equal, all these are rare qualities in an authentic masters. Therefore His Holiness Kyabje Trulshik Rinpoche is revered as a great master with immeasurable wisdom.